UW has practiced 10 times so far in camp. With no more two-a-days in college football, not all of the Cowboys’ instillation is in, but Bohl said he likes where things stand there as of now. Sophomore Cassh Maluia is UW’s starter at weak-side outside linebacker, but the competition behind him is between sophomore Ben Wisdorf — a Cheyenne East graduate — and true freshman Ryan Gatoloai-Faupula. Bohl likes how both have performed so far in camp. Gatoloai-Fapula goes by the nickname “Va,” and Bohl joked that he still doesn’t have his last name down in terms of saying it. According to the pronunciation guide on UW’s latest roster, this is how you say it: nuh-toe-LOW-eye, fow-PU-luh. NFL scouts from the Atlanta Falcons, Carolina Panthers and San Francisco 49ers were at Thursday’s practice. So far this week, scouts from nine NFL teams watched UW practice. As was expected after Wednesday’s practice, junior nose tackle Sidney Malauula (back) was held out of Thursday’s practice. Senior defensive end Trevor Meader (knee) and sophomore defensive end Shiloh Windsor (concussion) were limited. Senior fullback Drew Van Maanen (hamstring) looks to be back to full strength. True freshman defensive tackle Ravontae Holt changed his jersey number from 63 to 98. 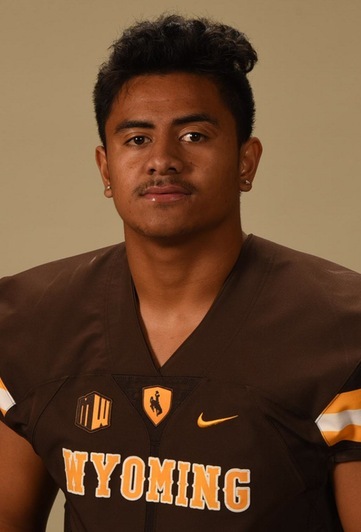 Holt is competing for playing time this season, and for more on him, see Friday’s Wyoming Tribune Eagle and Laramie Boomerang, and log on to wyosports.net. This entry was posted in Football and tagged Antonio Hull, Austin Conway, Ben Wisdorf, C.J. Coldon, C.J. Johnson, Cassh Maluia, Craig Bohl, Drew Van Maanen, Josh Allen, Ravontae Holt, Rico Gafford, Robert Priester, Ryan Gatoloai-Faupula, Shiloh Windsor, Sidney Malauula, Trevor Meader, Tyler Hall, Wyoming Cowboys, Wyoming Football by Robert Gagliardi. Bookmark the permalink.